I was browsing Ebay the other day and came across this bat being offered by a local seller. The auction was close to being complete and the price was still very low so I bid on it and won. Even with shipping, it was barely more than the price of the bat itself. It has JSA authentication as well. I'm not a huge fan of pitchers signing bats, but this seemed too good to pass up for a former Twin and Hall of Famer. I received a very quick return from Garry Roggenburk who signed his 1963 Western Oil Nicholas Volpe print in just 6 days. This makes 13 signed prints that I've received from this set. There are 24 prints in the set, but I think there are only one or two players left that I don't have that haven't passed away. 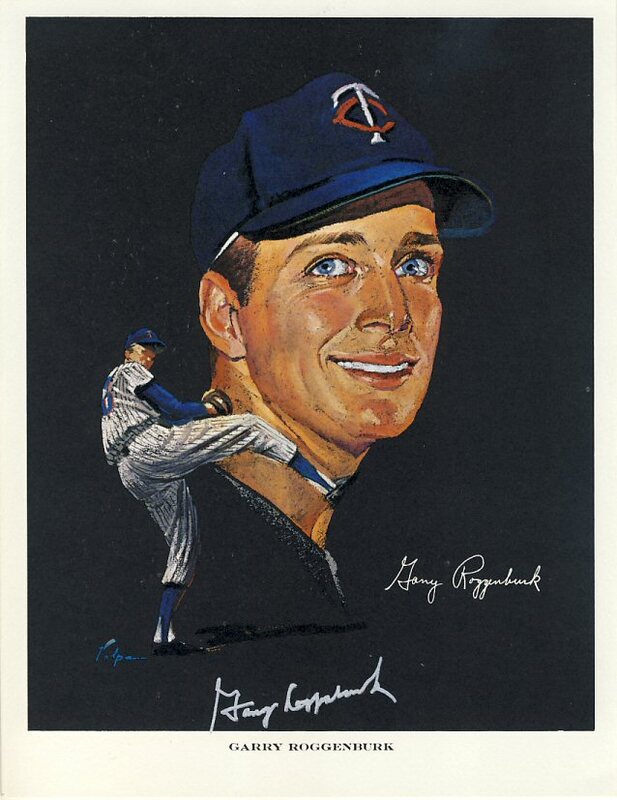 I had to buy a set of about a dozen of these unsigned prints on Ebay just to get the Mr. Roggenburk's. I kept the prints of the deceased players that I didn't have yet and am trying to sell the others individually on Ebay. These are rather hard to come by in decent shape, and they are usually sold in groups rather than individually. The 1964 set seems even harder to come by. I only have seven of those signed so far. I sent my A.J. 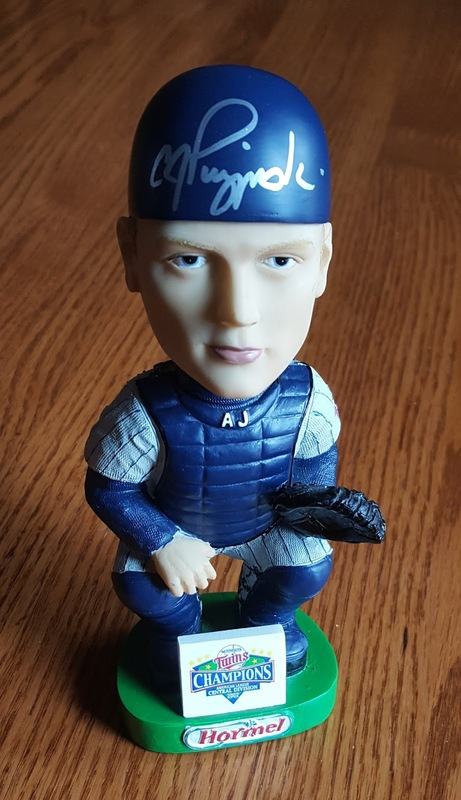 Pierzynski bobblehead into a signing held by an SCN contact and received it back this weekend. 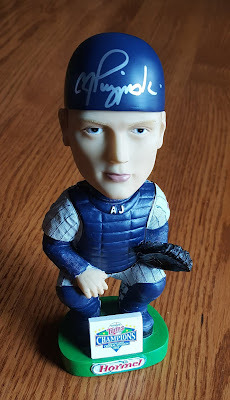 I still have a few SGA bobbleheads I need to get signed from back in the early 2000's including Guzman, Guardado, Gaetti, Aguilera and a bunch of Pucketts. It shouldn't be too hard to get Guardado, Gaetti and Aguilera, but Guzman might be tough. The Pucketts will be spendy if I can find them.